Published by Cyril Huze August 9th, 2016	in Builders, Editorial and Events. 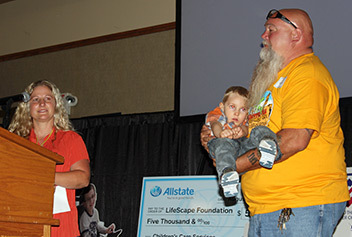 Proving again that bikers have big hearts for kids, the international motorcycle group Hamsters USA raised a record $285,395 for LifeScape Children’s Care of Rapid City in fundraising events this year, culminating with their annual gathering in Spearfish during the Sturgis Rally on Monday, August 8th. Hamsters USA has raised and donated funds at their annual meeting for the last eleven years, wanting to give back to the greater Black Hills community, which many Hamsters consider their second home. 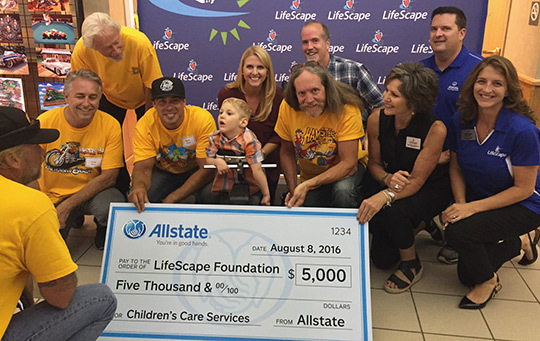 In 2015, the Hamsters broke the $2 million mark in total dollars raised for LifeScape Children’s Care in Rapid City. Their gifts help provide services to children in their Black Hills area homes and communities, delivered by LifeScape Children’s Care personnel who drive over 10,000 miles a month to provide services. A highlight of this year’s event was the presence of James Habeck and his family. James is four years old, working with LifeScape therapists to overcome hurdles due to his cerebral palsy, the result of a severe brain injury caused by lack of oxygen during birth. 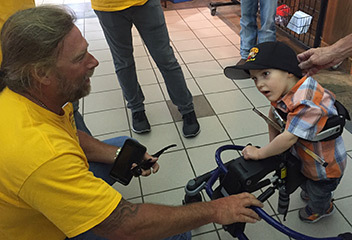 His parents, Jim and Melissa Habeck of Belle Fourche, continue to hope that one day their youngest son will walk and talk with help from LifeScape. The Habecks were proud to be an ambassador for LifeScape at the Hamsters’ event this year and loved the opportunity to thank them for their fundraising efforts that directly impact their family. James stole the show and stole the hearts of everyone there. Because of the impact he made on several Hamster members, donations totaling $36,950 were given in his honor, which added to the overall total for the evening. “No two kids with CP are the same, but James’ situation is so specialized, and their level of expertise is just great. I could go to other therapists closer to home, but they may not know how to work with kids like LifeScape does. If I didn’t have them, where do I go?” she asks. The Mustang gait trainer that James uses to scoot around his family’s rural home (or escape from his mother in Walmart) is such a new innovation that even some physical therapists who don’t specialize in children’s treatments have never seen one, Melissa said. Good job guys, as always! Doing for the less fortunate…great cause…big $$$. Thanks Hamsters! Great story! It’s amazing when people get together the things that can be accomplished! Wish the best to the Habecks and the LifeScape organization! Thanks for the love Hamsters, good on you! Nicely done! Class act all the way. Way 2 Go, Gentlemen !! !